Sponsored by: Funky Giraffe and Hosted by: Lil’ Blog and More. One thing that you’ll always use when your child is young, is a bib. It’s one thing you’ll need a lot of, and one thing you’ll want to invest in a little bit. You’ll want bibs that are going to last, and keep your little one comfortable, too. Funky Giraffe has bibs that are not only cute, but also well made, and functional. The front of Funky Giraffe bibs, are 100% cotton, and the back is fleece – The perfect pair, to keep dribble from soaking through. The back of there bibs, also feature “double poppers” so they’re also adjustable – To make them last even longer, and keep your baby comfortable. 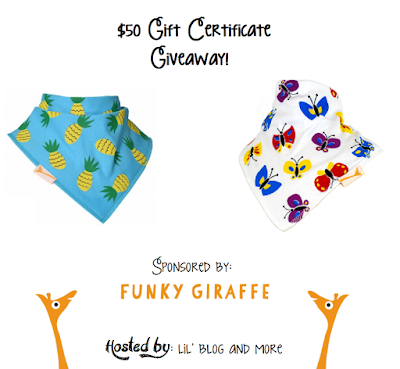 $50 Funky Giraffe Gift Certificate Giveaway! Disclosure: The bloggers involved in this giveaway were not compensated, and are not responsible for prize fulfillment. The prize is provided via the sponsor. Must be 18 years of age or older to enter this giveaway. This giveaway starts November 15th, 2015, and will end on November 29th, 2015 at 11:59 pm. The winner will be emailed, and have 48 hours to respond, or new winner will be chosen. Once a winner is drawn and confirmed, the name will be announced on the Giveaway Tools form.